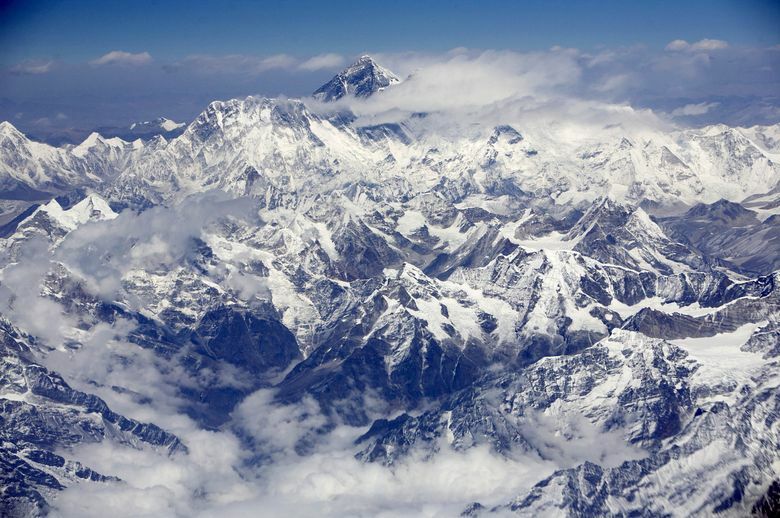 An aerial view shows Mount Everest, also known as the Sagarmatha, on the border between Nepal and Tibet. (Bloomberg photo by Adeel Halim). A retired engineer, of Washington state, wants to build a biogas digester to make fertilizer and methane from the tons of excrement left by mountaineers. “It’s my responsibility because I’m a climber and I can’t walk away saying my crap doesn’t smell,” Garry Porter said. Every year, some 1,200 people make a mad dash for the summit of Mount Everest during the climbing season that begins in May – taking on the arduous, often congested route to the world’s highest peak that most will not complete and some will not survive. Working against them: temperatures far below zero, altitude sickness with effects that range from disorientation to death, and the ever-present threat of frostbite. More than 200 corpses of ill-fated climbers line the mountain’s slopes, a constant reminder of those climbers’ fatal missteps. So it should probably come as no surprise if people traipsing up a mountain with its own death zone don’t give too much thought to one particular question: What should we do with all this poop? In the roughly two months that it takes to climb Mount Everest, the average alpinist will have produced nearly 60 pounds of excrement. This season, porters who work on Mount Everest carried down 14 tons of human waste from base camp and other locations. It’s dropped into earthen pits on Gorak Shep, a frozen lake bed near a village 17,000-feet above sea level, as The Washington Post wrote in 2015. It is a problem Garry Porter, of Washington state, is well aware of. He’s a retired engineer who got more than 20,000 feet up the mountain in 2003 before too-strong winds forced his climbing party to turn back. He’s spent a good chunk of his retirement thinking about Everest – and about how to clean it up. The device he’s come up with is a cross between a sewage treatment facility and a gigantic thermos – a digester, buried in the ground and surrounded by insulation. On top of that, subcontractors will construct a basic hut that will keep the elements out and keep the temperature above a relatively toasty 68 degrees. If the digester is too difficult to operate – or replacement parts have to be shipped across the world – it won’t last. And the goal is to ultimately turn over the device to authorities in Nepal, who will operate it. “I think you need to earn Everest,” he said. “I’ve spent years climbing lesser mountains – getting experience, getting confidence, and you work up to it.